Trader Joe's is a treasure trove for those who know what to look for, offering everything from killer snacks to sneakily great beer and wine. But often overlooked is the store's ability to help you build a show-stopping cheese plate at a fraction of the price you might pay at fancier grocery stores. Yet with enough cheese to satisfy a room full of Wisconsinites who studied abroad in France, perusing TJ's selection can be an exercise in trial and error. To make choosing the right cheeses easier, we sat down for a tasting with Michelle Stevens, owner of Buffalo, New York's Buffalo Cheese Traders, to identify the best cheeses at TJs. Obviously, you're gonna need some Two Buck Chuck before you read this. Generally, finding something “unexpected” in your food is a horrible experience. This isn’t the case when it comes to Unexpected Cheddar. This is, hands down, one of Trader Joe’s most talked about products, the Cookie Butter of the dairy section. It earned its name due to the small, salty pieces of parmesan hidden inside the sharp white Cheddar like little crystallized treasures. Each bite packs a surprise, leaving us to wonder what other things would be good to hide in a block of cheese. Flavor notes: The cheese’s super salty crystals add some great flavor and a slight crunch to the cheese. 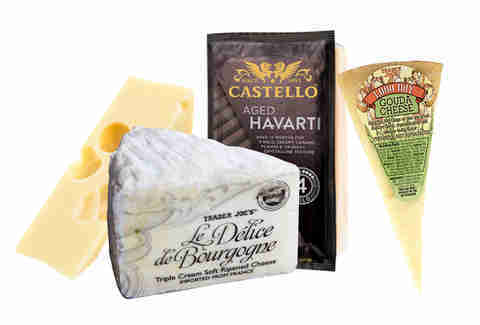 “It’s a great snacking cheese that held up well in its packaging,” says Stevens. What to do with it: Pair it with a mix of hard and soft pretzels with a variety of smooth, blended mustards, which would sync up nicely with the salt. In Europe, they've been known to use the same caves to age cheeses for hundreds of years, but in the US "cave aged" generally translates to a form of aging in a clean, humidity controlled climate. So even though this was made with minimal spelunking, it still has that ripe tanginess, texture, and aroma indicative of the subterranean practice. 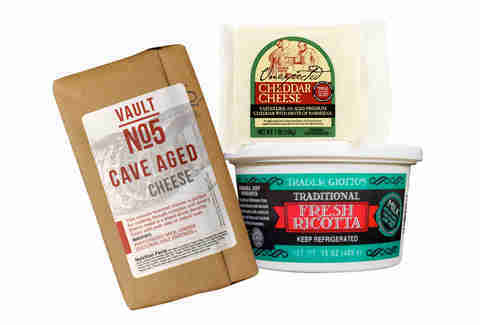 Although not categorized as a Cheddar, the Vault #5 from Jasper Hill -- not a TJ-brand cheese, but one you can find at the store -- definitely has a similar flavor, slightly sharp taste, and smooth texture. Flavor notes: “This cheese has a fudgy, nice creamy finish. It just melts in your mouth and saturates your tongue… you’re definitely going to want a drink with it,” says Stevens. What to do with it: This would be great on paninis or paired with marinated vegetables and olives. A piece of the cheese with marinated mushrooms or dalmatian prosciutto on a slice of crusty bread would make all the flavors pop. Ricotta is a universal cheese that can add a certain richness to foods like calzones, lasagna, and even desserts. Given its mild profile, don’t expect a strong flavor punch like you’d get from parm, but rather some mellow freshness. There are a few versions at TJ's, but go for the whole milk. When the fat content is higher, you really get that extra-creamy, smooth texture. Flavor notes: This particular ricotta is extremely mild, light, and fluffy... not too salty, which would make it a wonderful cooking cheese for texturizing dishes. What to do with it: Add it to pasta for a rich finish or use it to bake some warm ricotta cookies. You can just plate some of the cheese with a little lemon zest, salt, and pepper and chow down with a spoon and fresh bread. Wash it down with a light summer beer like a Kölsch. They say age ain't nothing but a number. But hey, when a cheese is aged for 1,000 days, you can be forgiven for ignoring old Aalyiah lyrics... or the fact that it's actually older than 1,000 days, given it had to get packaged and shipped. Anyway, the aging gives the cheese an intense flavor and causes crystallization. Flavor notes: When most people hear gouda, they expect a smokey flavor, which can often overpower often pretty strong. This isn’t smokey at all, but more briny and sharp. Its flavor intensifies when it’s paired with a fruity jam like fig or berry, making it the perfect blend of salty and sweet. What to do with it: Ever just craving some mac & cheese and wish you had something better on standby than some orange mystery cheese powder? Michelle suggests melting this down along with any other random cheese pieces you have laying around in the fridge, milk, and butter and tossing it with pasta. If there's leftover sauce, pour it into a muffin tin and freeze it. Whenever you’re craving a single serving of mac and cheese, you pop one out of the freezer and melt it into your hot cooked pasta for a fast alternative. 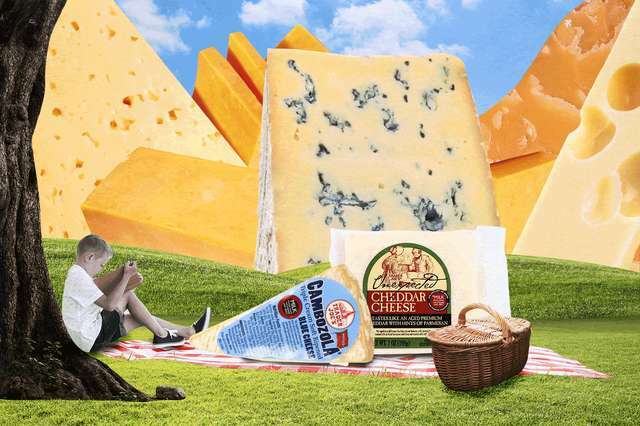 Castello has been at the cheesemaking game since 1893, long before the first Trader Joe's employee donned a Hawaiian shirt, but their recent addition to supermarket's roster is a welcome dose of old-school clout. Costello's aged havarti is a semi-hard white cheese that’s easily breakable with a visible white marbling on the outside because of the aging process. Flavor notes: Despite its semi-hardness, when you pop a cube of the havarti into your mouth, it melts leaving a slightly sweet, caramel flavor behind. Stevens notes that it's got a mild and buttery texture, but crystals throughout give it an unexpectedly nutty flavor. The cheesemonger’s suggestions: Pair it up with a bold flavored jam along with some toasted crunchy almonds and pecans. This triple cream soft-ripened cheese from France has a rich, buttery texture perfect for spreading on specialty breads and crackers. With some bries, the rind actually tastes pretty good, but don’t eat the rind on this cheese. It’s beyond strong it the worst way. But the actual cheese is so buttery and soft it practically falls off the knife on it’s way to your baguette slice. Flavor notes: It’s salty and creamy with a mild lemon tang, “a perfect gateway to the soft, creamy style. After getting used to this, you won’t be afraid to try something with a different finish and scent… something wilder and stronger,” says Stevens. What to do with it: First and foremost, don't eat it right out of the fridge. Letting the cheese sit out on your counter at room temp for at least an hour is so important with these soft cheeses to get the right texture. But after that, pair it up with a Belgian beer, dry ciders, mead, or a good bubbly like Prosecco. 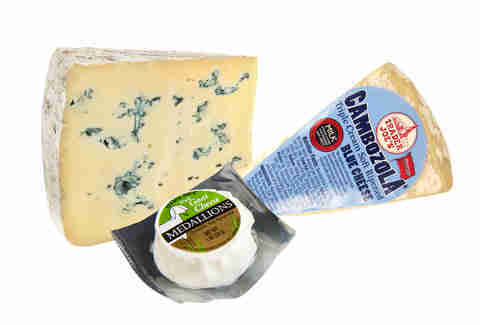 If you’re searching for a way to get that same bold flavor of a blue or a gorgonzola with a more satisfying texture, you have to try the Cambozola. You get the same buttery, spreadable texture similar to the Le Délice de Bourgogne with the strong flavor of traditional blues. Flavor notes: “I think Trader Joe’s version of a Cambozola is very well represented when it comes to other versions and it has a great texture. You’re going to get that peppery, nutty flavor throughout,” says Stevens. What to do with it: You can pair it with a bold, dark beer like a coffee porter and spread the cheese on a piece of hearty, toasted bread with pecans. For a dramatic twist, try it with (or in) brownies: put slices of the cambozola blue on top to let it melt a little then swirl it in with some dried cherries. These slices of soft goat cheese are submerged in olive oil seasoned with herbs, but they're not at all greasy. They're also really good at picking up whatever you roll them in, be it nuts, more spices, or Skittles, which we didn't try, but aren't at all opposed to, now that we think about it. Flavor notes: You definitely taste the herbs and spices in this cheese, especially the rosemary and the coarse black peppercorns. The tangy goat cheese is soft and effortlessly broken apart, making it easy to spread if crumbles of the cheese onto warm flatbreads. What to do with it: You can use crescent roll crust or pie crust to make a lavash or a flatbread. Just cook it in the oven with the cheese and tapenade or some caramelized onions and asparagus. Let it bubble a little and get that slight tinge of brown like a toasted marshmallow and you’ll be good to go. Jessica Kelly is a freelance food and travel writer that realized during this assignment that just eating a lot of cheese all the time doesn’t make you an expert. Watch her add extra cheese to already cheesy foods on Instagram @Adventures.Are.Waiting.